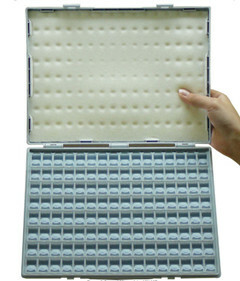 Our Super SMT Component Enclosure is the world's only enclosure for electronic components storage, which has > 100 compartments for enclosing SMT components, such as chip resistors, capacitors, inductors, ICs, etc. This enclosure has 128 or 200 individually lidded compartments, all covered by a top cover. There is a foam pad under the top cover, which presses down all the 128/200 lids onto their closing positions, thus, they can tolerate strong vibration and shock without opening, so that the parts inside will never be leaked out. On the bottom of the enclosure, it comes with 2 strips of rubber feet, they will lock into the 2 slots on the top cover of another enclosure when stacking enclosures together. 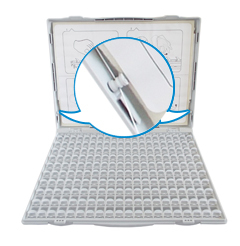 On the top surface, there is a label area, in which a label can be placed or marks can be hand written, for identifying the internal contents of the enclosure. There is also a side label area so that when the enclosures are stacked together, the internal contents can be seen easily from the label on the side. When ordering an empty enclosure, it comes with a set of labels, which can be hand written or laser printer printed with proper legend for each lid and the top and side labels. Using this enclosure will make your lab bench top neat and your parts well be organized. A new enclosure with the part number, SK200, has been launched in our website. This new enclosure features a slim but strong design, and comes with 200 individual lidded compartments. The top cover can be fixed in a certain angle, which helps save a lot of space.